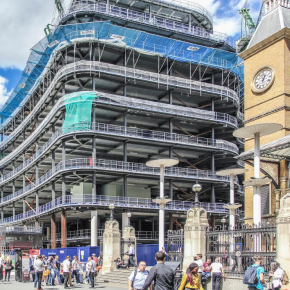 Aggregate Industries has continued to transform London’s skyline, with its latest project in the capital being part of £250m redevelopment of 100 Liverpool Street, where Lytag has proved the go-to concrete solution for high-end refurbishments and new builds. The high-profile redevelopment sees the original building revert back to its structural frame, demolishing half of it and rebuilding new infills in structural steel with the addition of three new floors to create modern, mixed-use space. Upon completion, it will offer 520,000 square feet of office and retail space, plus a new rooftop terrace with tremendous views of the city. A vital requirement for main contractor, Sir Robert McAlpine, was to source a concrete solution which could allow more floors to be cast, with no compromise to the dead load of the overall structure. Lytag from Aggregate Industries’ proved the obvious choice – this highly innovative lightweight aggregate solution can effectively lower the composite deck concrete slab load by roughly 25% over normal weight control, while offering the same level structural performance. Made from secondary aggregate, Lytag also offers a far more environmentally friendly alternative to standard concrete, because its unique properties can substantially reduce the amount of material required on a project, along with the connectec carbon emission produced in delivery. Aggregate, working with its specialist London Concrete unit, supplied 5000 cubic metres of Lytag to the project, with the building containing a range of sustainable features that complement the significantly lowered carbon footprint. 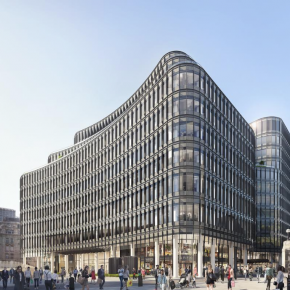 As a result, 100 Liverpool Street is expected to receive an Excellent rating in BREEAM. Barry Mellor, Commercial and Technical Manager for Lytag, commented: “The redevelopment of 100 Liverpool Street is a major milestone in Broadgate’s evolution into a world-class, mixed-use destination for London.